Can I buy Losec (omeprazole) online? 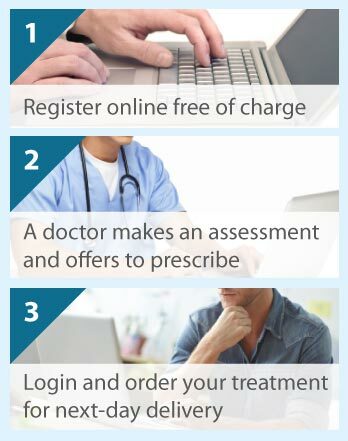 The Online Clinic can prescribe Losec or the generic equivalent (omeprazole) online in certain circumstances. Please complete a quick online consultation and we can make a fast assessment. Order before 4.00 pm Monday to Friday and you will have your treatment the next day. Omeprazole (also known as Losec) is used for the treatment of intestinal (gut) problems, including heartburn, peptic ulcers, and other complications caused by too much acid in your stomach (e.g. symptoms of gastro-oesophageal reflux disease or GORD, reflux oesophagitis, and Zollinger-Ellison syndrome). Omeprazole also prevents and treats peptic ulcer symptoms that may arise from taking non-steroidal anti-inflammatory drugs (NSAIDs) and, when given with antibiotics, destroys bacteria known as Helicobacter pylori that cause peptic ulcers. Additionally, omeprazole can prevent you breathing in stomach acid when you have an anaesthetic. Omeprazole is one of a class of medicines called proton pump inhibitors that work by reducing the amount of acid produced in your stomach. To digest the food that we eat, cells in the stomach lining produce an acid. The stomach lining is normally protected from the damaging effects of the acid by a coat of mucous. However, if this protective coat is defective then the acid can erode the stomach lining resulting in an ulcer. The acid may also irritate the food tube if it is able to flow back out of the stomach, causing pain, a burning feeling, and inflammation. Proton pumps are part of the mechanism enabling the cells in the stomach lining to make acid. A proton pump inhibitor stops the cells in the stomach lining from over-producing acid, thereby reducing the stomach acid level and allowing the ulcers and other affected tissues to heal. Proton pump inhibitors are sometimes prescribed to patients who require long term NSAID therapy. An example of an NSAID is Ibuprofen. Medications such as omeprazole help protect the stomach against aggravated injury as a result of the use of NSAIDs. Take omeprazole exactly as your doctor has instructed. Your prescription of how much, when and how frequently to take your medicine will be best suited to your condition. Omeprazole is available as capsules, tablets and, when you have problems taking it by mouth, as an injection into a vein. The capsules and tablets should be taken in the morning and swallowed whole (not chewed, crushed or damaged). In these forms, omeprazole is contained in pellets. The pellets prevent stomach acid from breaking down the medicine in the stomach where it does not work. However, if swallowing them is a problem, you can open the capsules and swallow the pellets directly with water, or put either the capsule pellets or tablets in water, fruit juice (apple, orange or pineapple) or apple sauce. Take any forgotten dose as soon as you remember but not if it is close to the time of the next dose. Do not try to make up for the missed dose by taking a double dose, and talk to your doctor immediately if you take too much medicine. Children and adults can take omeprazole. Do not take this medicine if you have an allergy to omeprazole or any of the medicine's other ingredients, or are taking HIV medication containing nelfinavir. You should let you doctor know if you have osteoporosis (weak bones) or are taking corticosteroids that increase the chance of getting osteoporosis. Omeprazole can mask symptoms of other conditions, so let your doctor know before and during treatment if you have any gut disturbances such as unexpected weight loss, vomiting blood, stomach pain, black stools, or persistent diarrhoea. Before taking omeprazole tell your doctor if you are pregnant or breast feeding, or are taking (or recently taken) any other medicines. Omeprazole interacts with some medicines, making either or both less effective. Therefore, you should specifically mention medicines used for the treatment of HIV, fungal infections, heart and vascular problems, anxiety or depression, epilepsy, tuberculosis, organ transplantation, and cancer. In any event, we need to know of any medications (even over the counter therapies) that you are taking to ensure your safety. Your doctor will want to monitor you regularly if you take omeprazole for more than a year. Omeprazole most frequently causes headache and has effects on the gut, e.g. nausea, vomiting, stomach pain, diarrhoea, and constipation. It may also cause dizziness, ‘pins and needles’, disturbed sleep, an itchy skin rash, ankle swelling, bone fractures (hip, wrist or spine), changes in liver function tests, or a generally unwell feeling. Rare side effects include problems with your blood, breathing, kidneys or liver, blurred vision, dry mouth, joint or muscle pains, gut infection (thrush), hair loss, or agitation, confusion or depression. Breast swelling in men, and problems getting and keeping an erection are very rarely seen. Stay online and get the advice of an experienced doctor if you think you need treatment for a stomach problem. By clicking on the Free Consultation button and completing the short online questionnaire you can get treatment for such conditions.